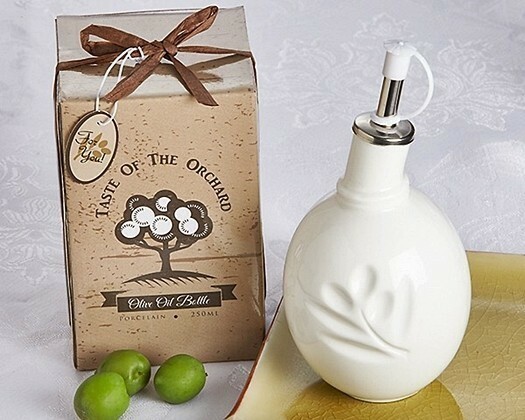 This olive orchard-themed olive oil bottle features an olive branch depression on an olive-shaped porcelain bottle with an extended pouring spout. Pair it with our equally wonderful "Taste of the Vineyard" vinegar bottle (available separately as Product Code: NO-A93026) for a gorgeous set worthy of your kitchen. Each bottle comes packaged in an orchard-themed gift-box featuring earth tones and artwork and an accented title banner. The gift-box is finished with a brown raffia ribbon and bow and a coordinating grape-themed "For You" gift tag. Made of high quality porcelain, each bottle holds 10 fluid ounces. By Artisano Designs.